I’m working on a little rts-game. 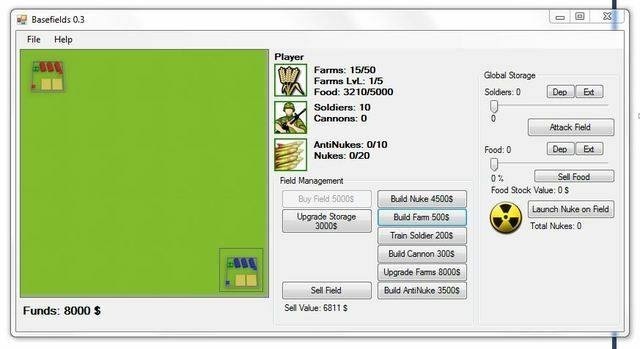 You got a grid 5×5 with “fields” that can be bought and built into a base. Each base contains farms, food, soldiers, cannons. Farms give food for the soldiers, food can also be sold which is the main income atm. There are also citizens, which generate income from each field. Give it a try and see if you can beat the AI. The new followup to IslandBis(z)1 haven been under development for quite a time now. And it’s time to release it. It’s a quite advanced Island simulator/tycoon game where you control almost every aspect of it. You set the taxes, the car taxes. You build factories and research centers to produce and research new technology. Cause some day a deadly pandemic outbreak might happen. As posted in previous post it simulates many different things, that all makes this game be more “alive”. What are you waiting for? Download it and try 🙂 It’s totally free! Also, you might need .NET Framework 3.5. Get it from microsoft. The new followup to IslandBis(z)1 haven been under development for quite a time now. And I’m getting ready for a release. Currently the Beta is under testing. The game itself features most of what IslandBis1 was, and much much more. It’s not only a simulation of the island but it simulates each and every person living on the island, down to how happy they are and if they own a car. It means that every single citizen got their own set of features, and needs. A floating economy based on income from citizens, and there are several adjustments available trough the interface. A short list of what will be simulated/calculated within each citizen. – Food, they eat food to heal, and it costs money. – Cash, they all got their own economy(also different income classes). – Health, yep they can get sick. Virus/disease or just getting old. – Male of Female, pretty basic feature. – Thoughts, they will react to tax adjusting. Government spending etc. – Things to spend money on, home, car etc. This will affect happiness and income. – If they are working or not, also different types of income. I’ve also put in a research center, where you can hire/fire scientists to research new techs for your island. Improvement of pollution removal, health, food etc. And there is also a scenario feature, where you can challenge yourself. Added Show Values, so that happiness etc has numerick values too. Added more toughts, when in pain etc. Added Vitamins & AntiDepressant pills. Added Beer at the local Grocery Store. Added a Casino, think you’re lucky? Added deathreason is now written in the toughts textbox. Adjusted Food, food is more food. Adjusted workout to be more effective. Cleaned up alot of code to be more effective. What would you like to se more of? Jesus on Got a Chinese only Youth router from Xiaomi? And want English firmware? Jinesh on Got a Chinese only Youth router from Xiaomi? And want English firmware? Tolo on How to make a light tracker using arduino & photoresistors! rdbhaxor on How to make a security alarm using LDR and Laser!